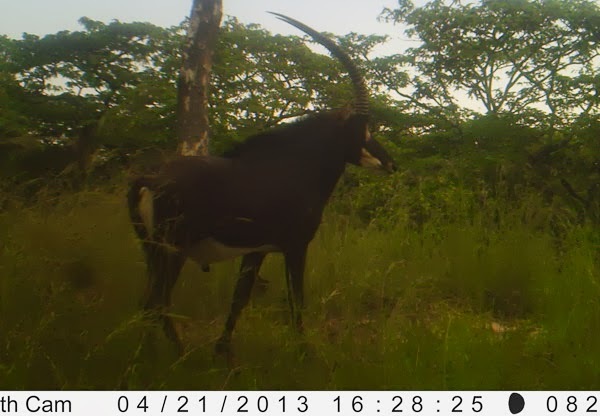 Visit our Giant Sable page to read biologist Pedro Vaz Pinto’s Second Trimester 2013 Report with photos from Angola’s Cangandala Park, in English and Portuguese. Duarte is back! Duarte está de volta! The sable bull carcass; A carcassa da palanca morta. 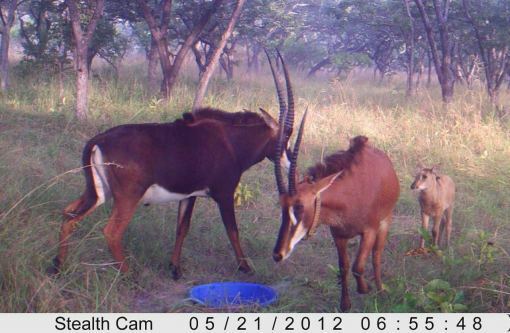 Visit our Giant Sable page to read biologist Pedro Vaz Pinto’s Fourth Trimester 2012 Report with photos from Angola’s Cangandala Park, in English and Portuguese. 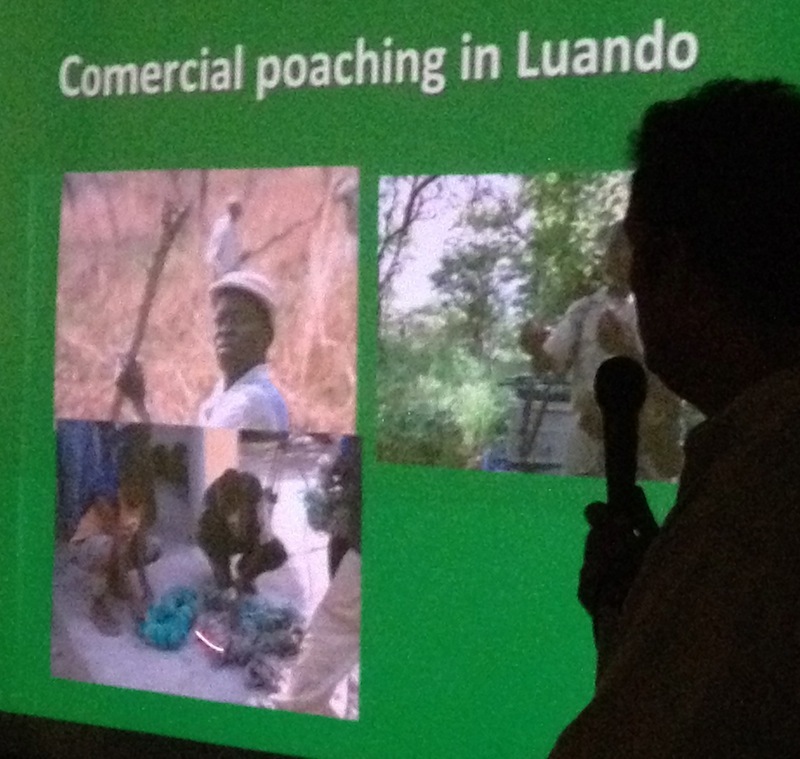 Pedro Vaz Pinto updating the Angola Field Group. 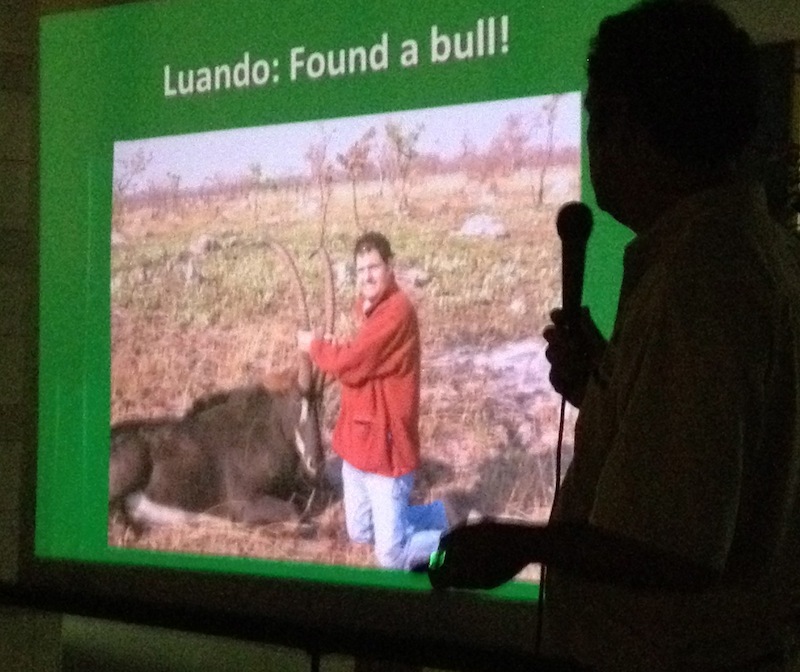 Biologist Pedro Vaz Pinto presented an update on Angola’s endangered giant sable (palanca negra gigante) to an audience of over 150 members of the Angola Field Group on October 25, 2012. 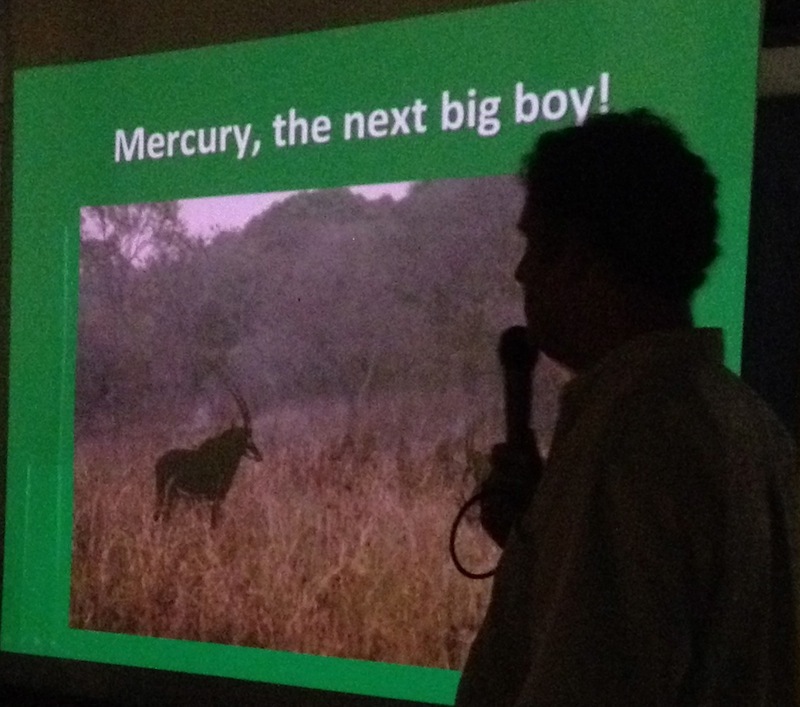 Audience hears the latest about the giant sable. 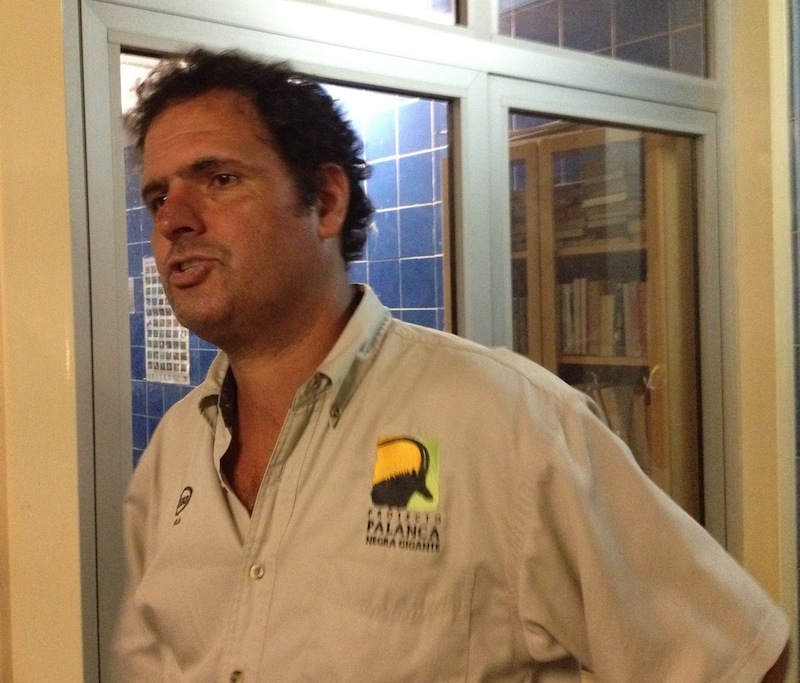 In the following video (part two of two) Pedro Vaz Pinto discusses the 2003 launch of the Giant Sable Project and Conservation Initiative in partnership with the Ministry of Environment – the project’s original objective was to locate the giant sable; the creation of the Shepherd Program in 2004; the publication in 2005 of the first photos of giant sable taken since 1982; information about the hybridaztion of the species that has taken place in Cangandala plus more Giant Sable project highlights up to 2008. 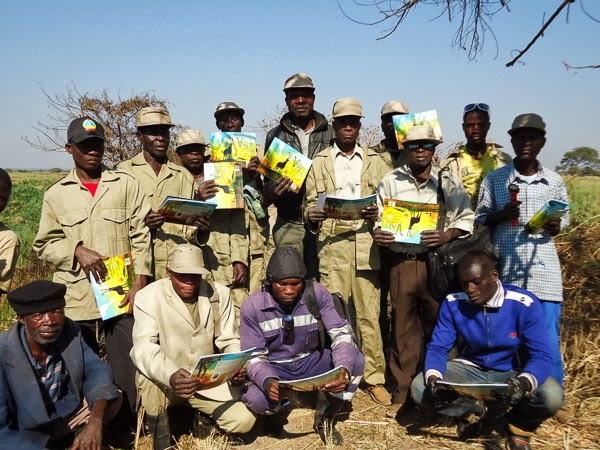 Since 2009, the bulk of the project’s activities are being implemented by the Kissama Foundation and the main priority now is conservation of the giant sable. 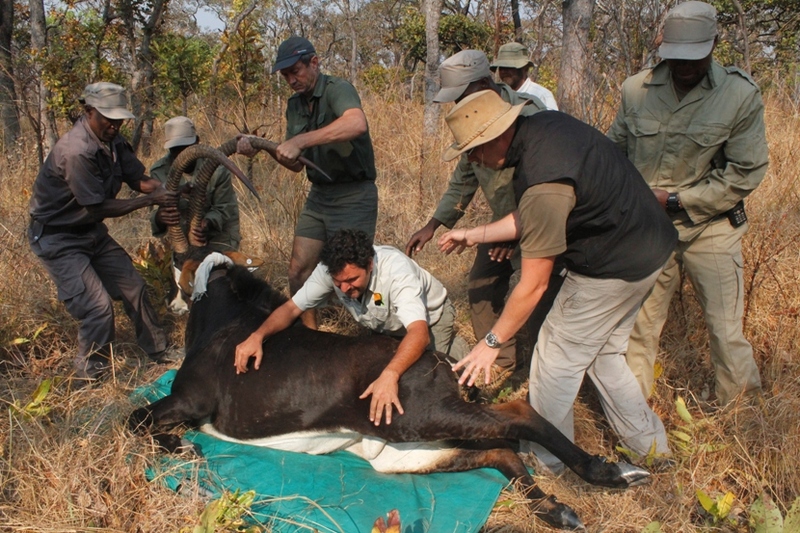 2010: The first two calves were born in Cangandala and a new fenced camp of 2400 was created (in the process 10 hybrids were inadvertantedly caught inside). 2011: A new camp of 400 ha was built and a new capture operation was launched; hyrbids were confined in a third camp. 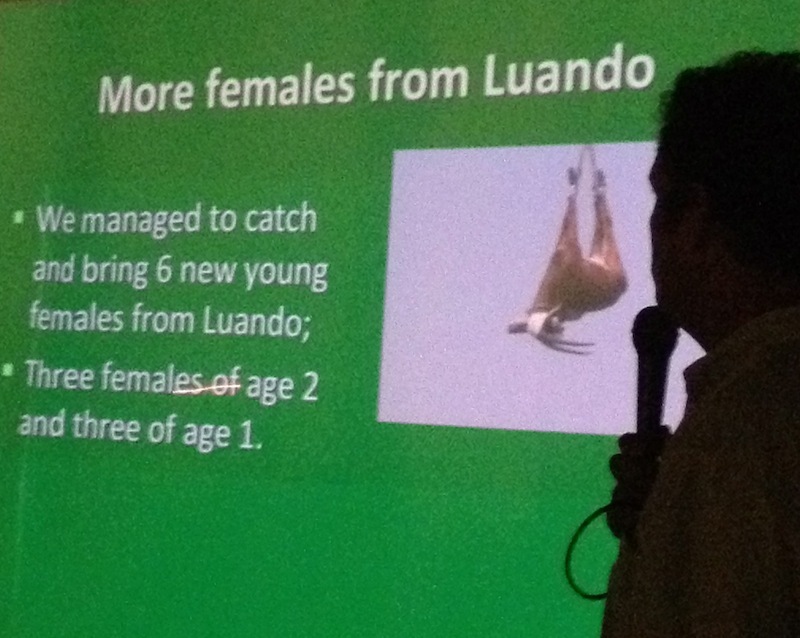 The team managed to catch and bring 6 new young females from Luando reserve: three two-year olds and three one-year olds. Two new bulls were also brought in: a young male and one ‘at the prime of life’ named ‘Ivan the Terrible’ due to his uncontrollable nature. Ivan eventually killed the young male and broke through the fence. A third calf was produced. 2012: Two females died of old age; one female became pregnant again and the first calf born in 2010 is now preparing to take over the herd. 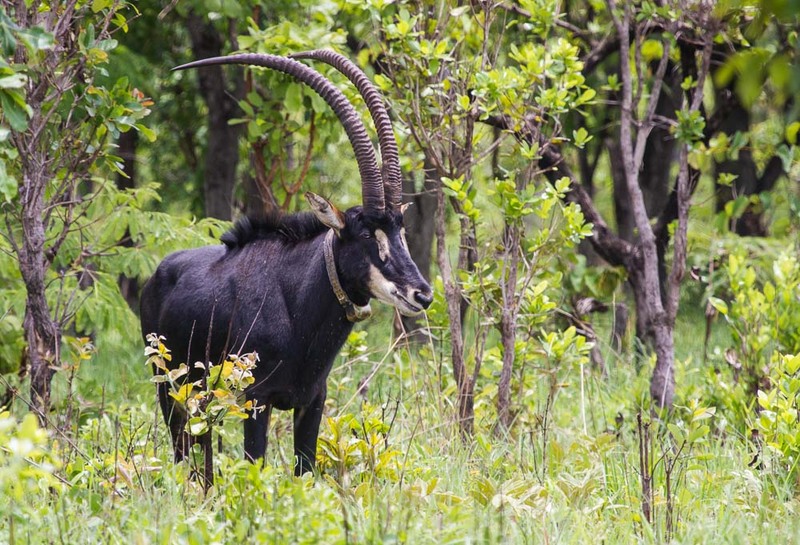 Currently poaching is the main threat to the giant sable. Snares and pit traps are widely used causing severe trauma and death. A staggering 15% of adult animals captured or photographed had nasty leg injuries caued by traps. About 75% of the Luando reserve is devoid of sables and less than 80 are estimated to survive. The total number of giant sable left is less than one hundred animals making it one of the most critically endangered mammals in the world. Plan for 2013: Up to twenty giant sable should be darted and released with VHF and GPS tracking devices for monitoring. Infrastructure should be built in Cangandala and the breeding program monitored. Ongoing genetic and ecological research will continue and be reinforced. 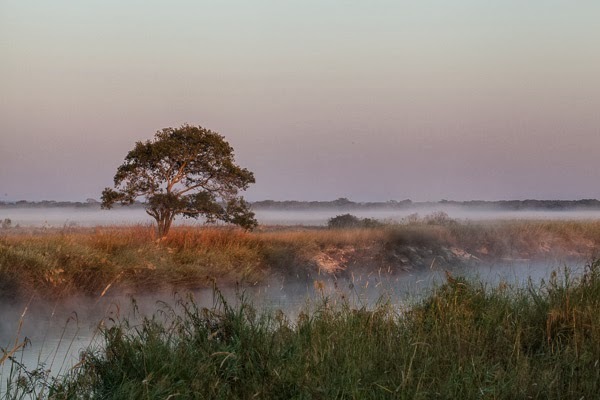 To read Pedro Vaz Pinto’s quarterly reports on the Giant Sable Project visit the Giant Sable page on this website. Pedro Vaz Pinto at the presentation. 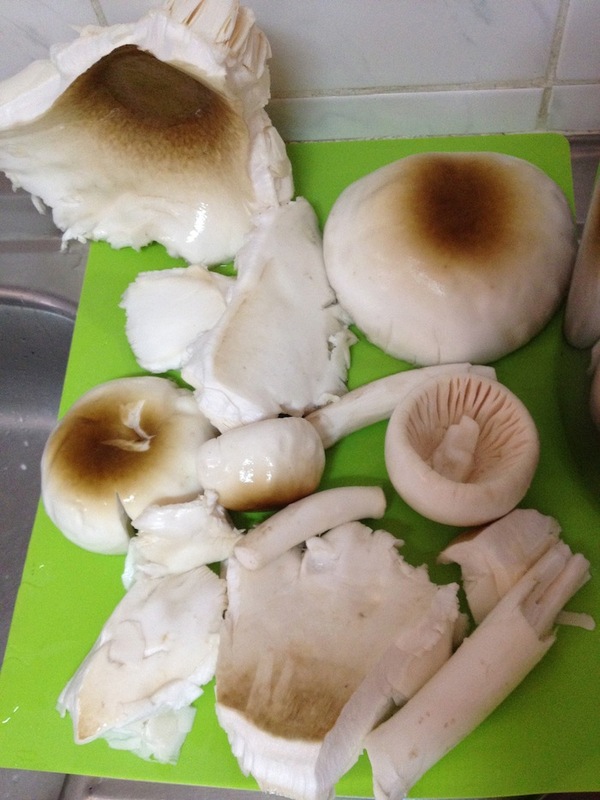 Edible, wild mushrooms fresh from Cangandala Park pop up during the rainy season. 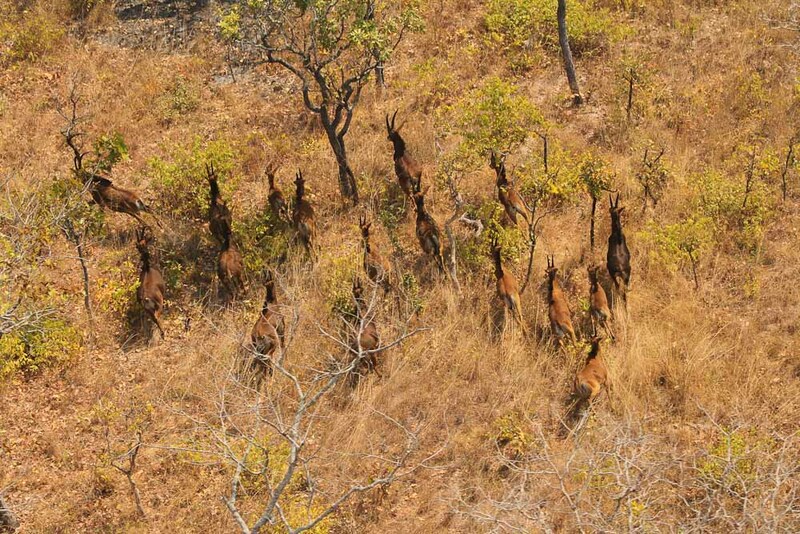 The largest herd of giant sable in Lunado. 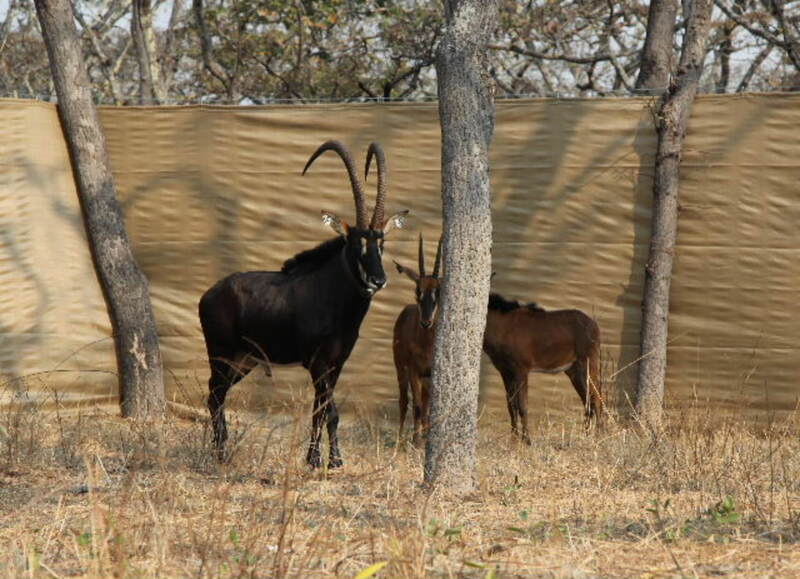 Angola’s giant sable (palanca negra), usually regarded as the most magnificent antelope in the world, is also one of the most endangered mammals in Africa today. 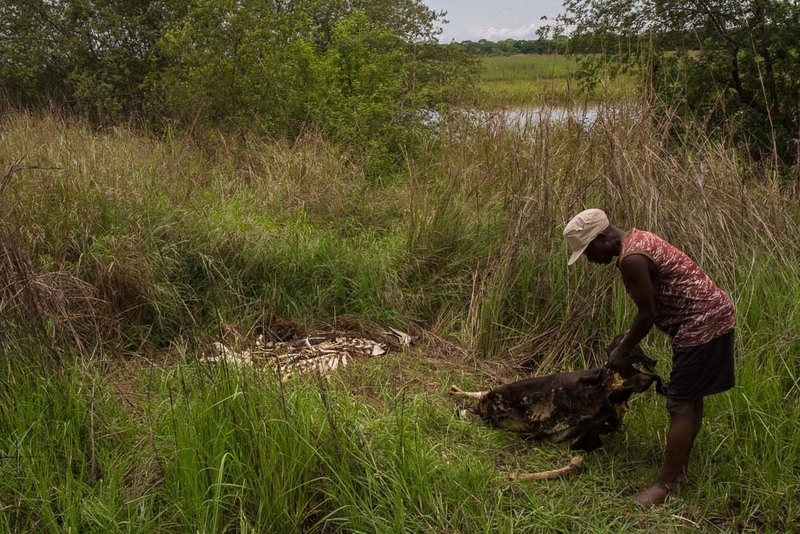 From civil war to cross breeding and poaching, this animal’s struggle to survive continues. 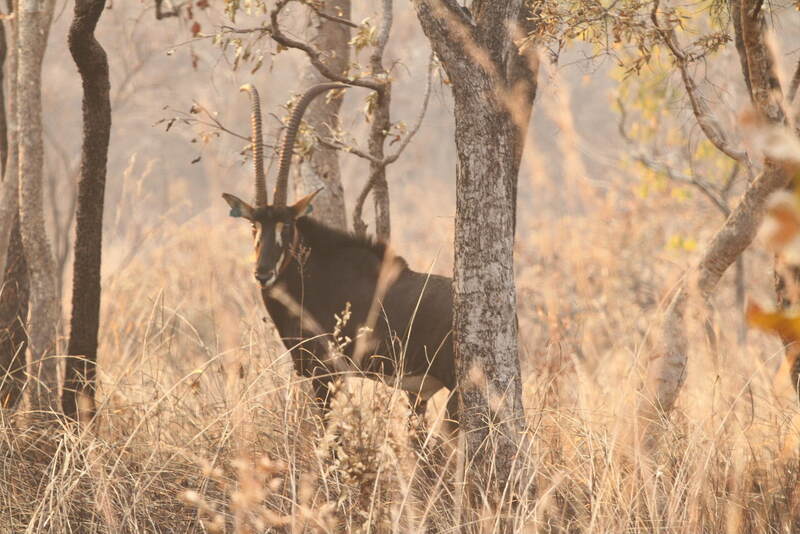 The Angola Field Group invites you to hear an update on The Giant Sable Conservation Initiative, Thursday, October 25 at 8:00 pm at the Viking Club, with Biologist Pedro Vaz Pinto, the man who has spent the last decade rescuing Angola’s splendid antelope. 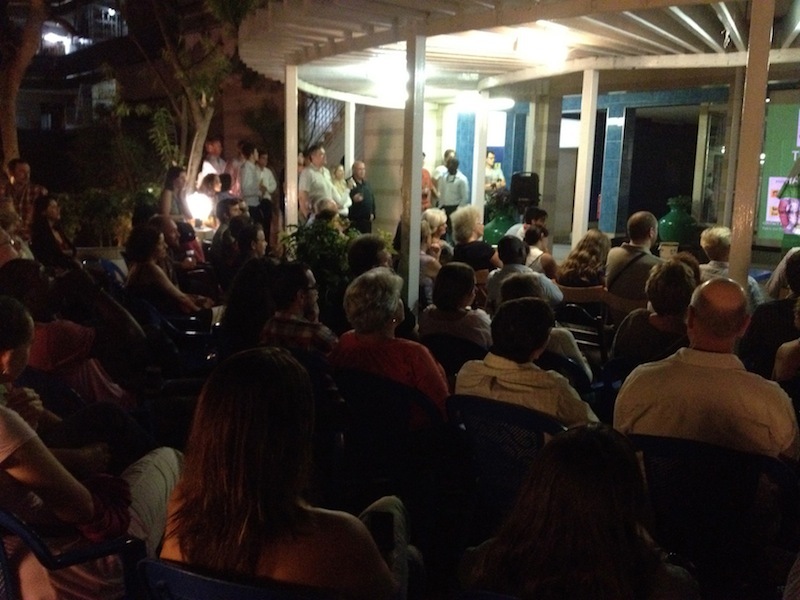 Pedro is also program manager for the Kissama Foundation and researcher at the Catholic University. Everybody is welcome to attend this presentation. The talk will be in English. In close cooperation with the Viking Club, this event is offered free of charge. Beverages and snacks are sold at the Viking Bar which opens at 7:30 PM. Coupons must be purchased. For sale, traditional baskets hand woven and organic wild honey from Moxico, Angola natural medicine books and posters, a new children’s color illustrated storybook and a book about the Cuvalei Basin in southern Angola. You can download a map showing the location of the Viking Club on our Join Us page here. The Viking Club is on the main floor of Predio Maianga, the former Swedish Building, at Rua Marien N”Guabi, No 118 in Maianga, across the street from the new Panela de Barro restaurant. And the big surprise: A little newborn calf with her young mother! Visit our Giant Sable page to read Biologist Pedro Vaz Pinto’s latest news updates with photos from Cangandala Park, in English and Portuguese. 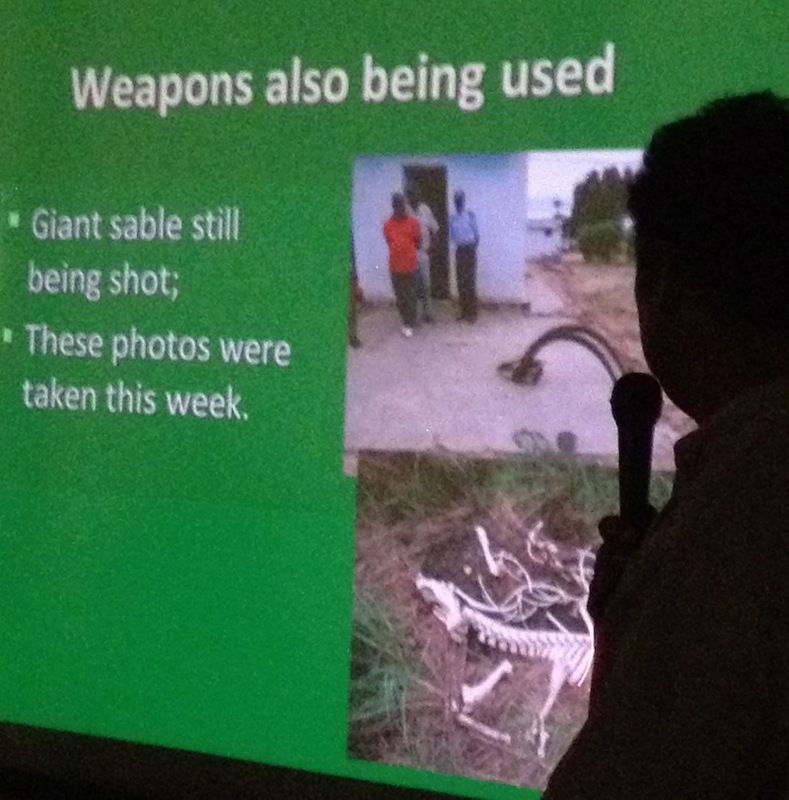 Newly posted, Pedro Vaz Pinto’s report of this August’s Giant Sable Capture Operation. Click here to read the Second Semester Report 2011 in English and Portuguese and see some stunning images of the operation in action. 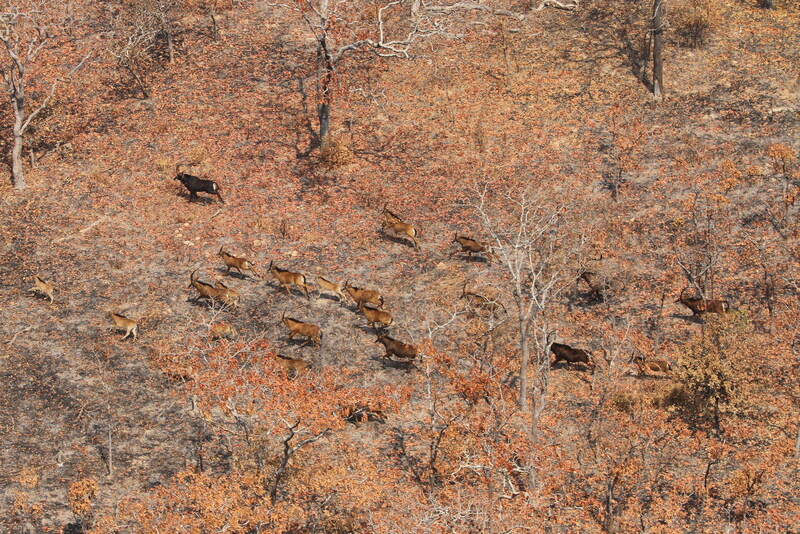 The largest giant sable herd, led by the dominant bull. 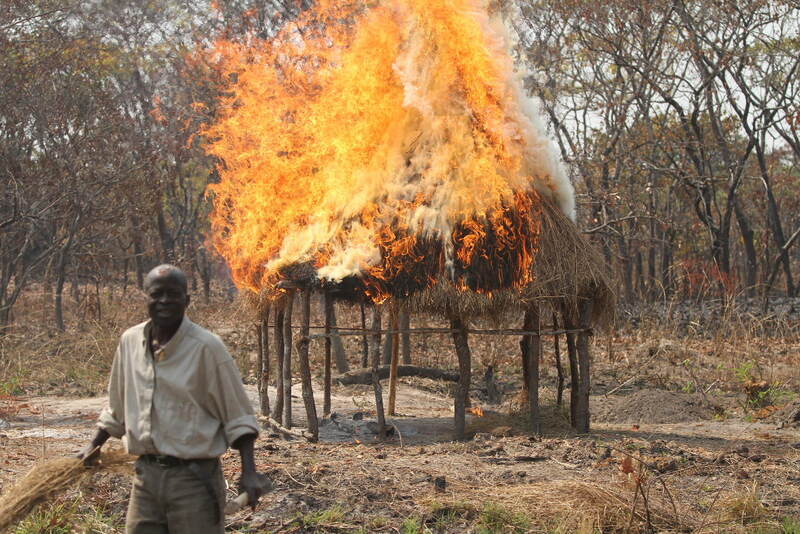 The shepherds setting fire on a poacher's camp in Luando. 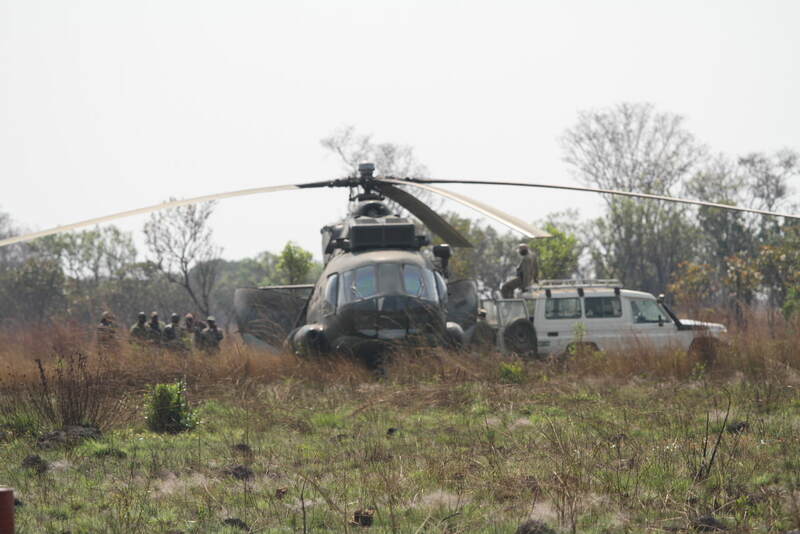 Logistics provided by the Angolan Air Force. Trying to put Ivan on the stretcher to be hand carried to the MI-17! The difference in size is immense. The bull wouldn’t leave his girls, would he?